Recently retired clinical psychologist Mary Jane Gandour spoke with Dr. Heidi Horsley at the 2015 Association of Death Education and Counseling conference. Currently, Dr. Gandour is writing a memoir about the grief process. “My daughter Amy died at the age of 14” of leukemia, and that’s just one of many family deaths in the past recent years for Gandour’s family. “She had been diagnosed when she was six, so she managed to live over eight years.” Dr. Gandour’s other daughter, Molly, recently debuted a documentary on the family’s grief, which Dr. Horsley commends as very courageous. “Molly appeared to be doing so well after her sister died, and she grieved in ways that seemed appropriate for kids,” says Dr. Gandour. However, years later at 26, Molly told her mother that the entire family had a lot of work to do in order to grieve successfully. The family spent six weeks together interviewing one another daily, attending therapy, visiting the facility where Amy was treated and genuinely engaging in an intensive therapeutic process—which Molly filmed. For Molly, filming was key to grieving. Now, Dr. Gandour is pursuing her own unique means of grieving via writing and creating her memoir. She says that finding hope after losing Amy wasn’t easy. “Our daughter loved all of us and we loved her…we had a lot of support from our families, from friends,” she says. “Some of what we did is what families do: You get back into routines. We had a lot of rituals that we did. We certainly remembered Amy on all of the holidays.” However, many people wanted to talk about Amy more, and Dr. Gandour said that simply wasn’t achieved often enough. 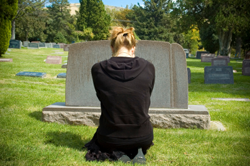 Finding your own way to grieve is paramount, and it can take years to discover. However, it’s not too late. Whether it’s film, writing or another strategy, working with a therapist can help you streamline your own process.